Agent Jane is a hot blonde, but she is not your average blonde because she is a secret agent that goes on undercover operations and she uses her golden hair and her great looks as a weapon to seduce enemies to get what she wants. Microgaming invites all of its players to accompany this powerful agent as she goes on undercover operations so they can get to claim their share of the prize and the rewards. 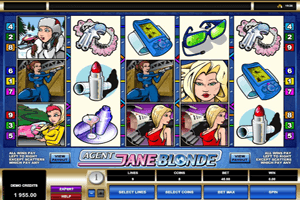 Play Agent Jane Blonde Slot here. Players will enjoy a high paying gaming experience that comes in five reels and a total of nine bet lines that players can place their bets on. They can place these bets at the bottom of the screen right under the reels of the slot machine. As for the symbols that will appear for players on the reels and the lines of the game, they include the logo of the game, the agent herself, a smoking gun, explosive gum, night vision goggles, lipstick, a GPS watch and other tools that the agent uses on her operations. The logo of the game in the crosshair is the scatter bonus symbols of the game. Three logos anywhere on the reels will activate 15 free spins for players. The beautiful agent is the wild symbol which will not only substitute for other symbols, as it will also double all payouts that it help in creating.